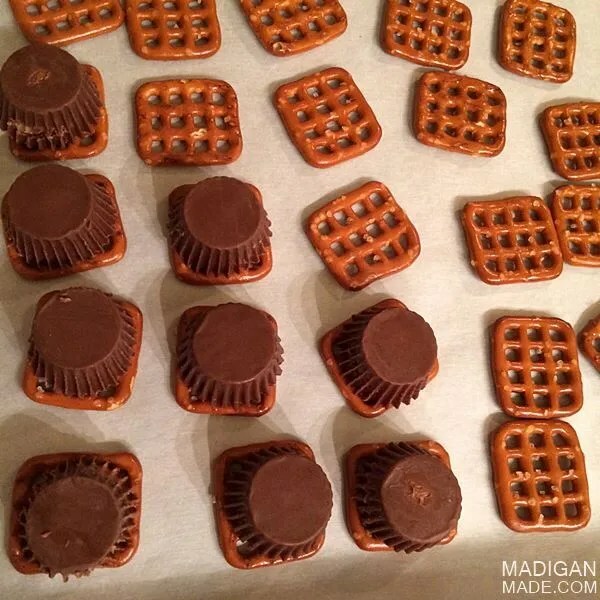 Madigan made… peanut butter and pretzel candy bites. 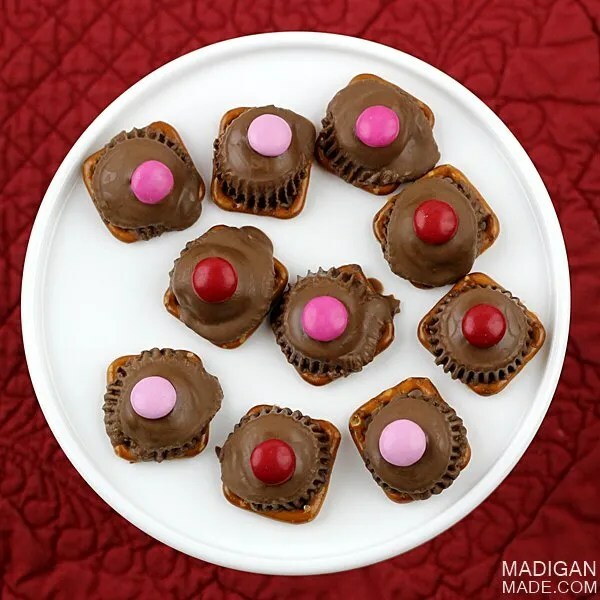 Need a simple candy treat idea for your Valentine? 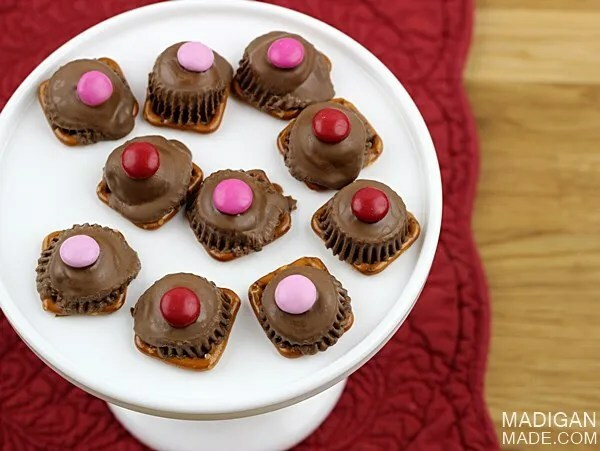 I’ll be honest, these chocolate and peanut butter bites are good ANY time of the year… but with some seasonal candy decorations, these would be a sweet treat to make for Valentine’s Day. I was inspired to make these candies after the Rolo and pecan pretzel bites that I shared with you a few years ago. I knew that other types of small candies might work on top of a pretzel… and I decided to try combining peanut butter cups with the pretzels this time. 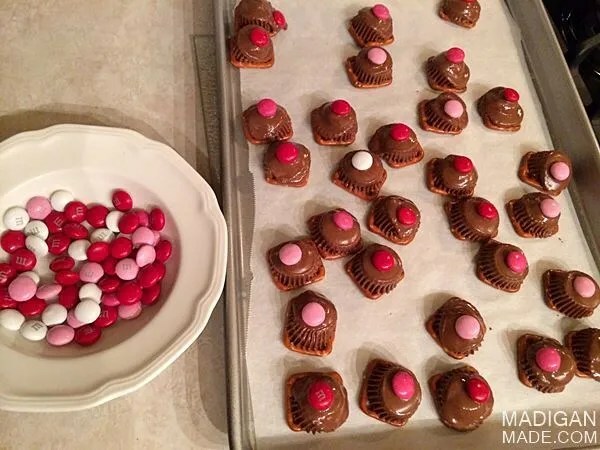 I grabbed some holiday M&Ms to make them festive for Valentine’s Day. It was SO worth the experiment! Line a baking sheet with parchment paper. Lay pretzels flat onto the sheet. Stack a candy cup on top of each pretzel. Place the tray in the oven and bake the chocolate and pretzels for about 60 to 90 seconds or until chocolate is softened. Watch carefully! When the chocolate is soft, pull out the baking sheet and very quickly press the colored candy down on top of each cup. Allow the candy to fully cool. Some of the candies may slide off the chocolate or the chocolate may look a little mashed or melted. Don’t worry if that happens. Trust me, they still taste great and no one will be complaining, just eating! Looking for more peanut butter and chocolate combinations? Check out my peanut butter and chocolate pretzel sandwiches…. they are really easy to make, too! 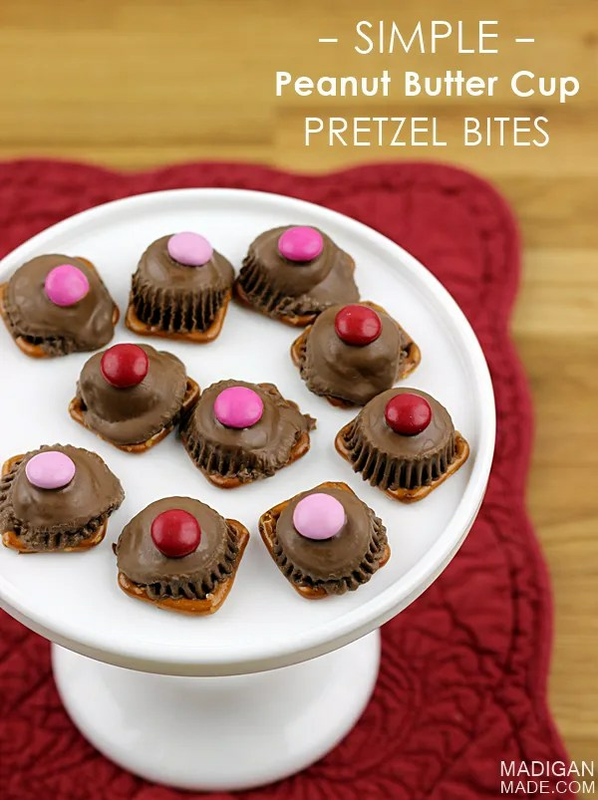 And if you like chocolate and pretzels, these Rolo and pecan pretzel bites are also just as simple to make, too!